Former European Commission President Jacques Delors has backed the former WTO Director General Pascal Lamy to succeed José Manuel Barroso as the head of the EU executive next year. Lamy is member of the socialist political family, for which Martin Schulz is almost certain to carry the Commission nomination in the upcoming EU election campaign. Asked by the Belgian public broadcaster RTBF on Friday (11 October) who would be the best person to lead the next European Commission, Jacques Delors (88) said: “I might be accused of favouritism, but the best candidate would be Pascal Lamy." “Throughout his work, Pascal Lamy showed that markets need freedom, but regulation just as much. By the way, that’s exactly the German economic model: social market economy,” Delors said. Lamy, a top-level French economist and politician who led the World Trade Organization for the past eight years, reportedly responded to the compliment, saying “there is a father-son bond between [Jacques Delors] and me”. From 1985 to 1994, Pascal Lamy served as Delors’ head of cabinet, when Delors held the position of Commission president (of the European Economic Community). Lamy also fulfilled a mandate as EU commissioner for trade during Romano Prodi’s presidency of the EU executive (from 1999 to 2004). Lamy recently left the WTO following the end of his mandate as director general (from 2005 to August 2013). Lamy is a member of the French Socialist Party (PS) and would have to carry its nomination as common candidate to lead the EU elections for its umbrella group, the Party of European Socialists (PES). EURACTIV has reported that the PES is almost certain to nominate Martin Schulz as its lead candidate and front-runner, provided the SPD is able to broker a power-sharing deal with Chancellor Angela Merkel at the head of the German government. The Commission presidential candidate is formally named by heads of state and governments taking into account the results of the European elections. Coming up with common candidates is an initiative by the European parties to press the European Council into selecting the winning party’s front-runner as the next Commission president (see background). Negotiations could heat up in the months following the May 2014 elections. European Council President Herman Van Rompuy expressed similar concerns in a debate on Friday, when he dismissed the idea of common candidates as “organising the disappointment in advance”. The interview with Delors was conducted on the margins of a conference held by Le Nouvel Observateur and other media in Brussels on Thursday. The ex-president debated the future of the EU in a high-level discussion between Van Rompuy, former French President Valéry Giscard d’Estaing and former Spanish Prime Minister Felipe González. In a report published yesterday (14 October), the Centre for European Reform think tank said that the proposal to put forward 'faces' for European elections to improve democratic legitimacy was ill-fated. "National leaders must themselves get out in the campaign because they have the clout and credibility to make the case for the momentous decisions they took to save the euro. EU-level policies have become much more salient and citizens in every country have strong views on them now," write analysts Heather Grabbe and Stefan Lehne. EU affairs pundits and European parties have pushed for these parties to nominate their front-runners in the election campaigns. This would make the European elections ade facto race for the Commission president seat, would politicise the campaigns and could increase voter turnout, they say. 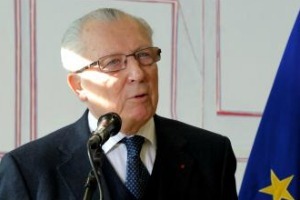 RTBF source: Jacques Delors: "Mon candidat pour la Commission ? Pascal Lamy"
Even in its desperate state, EU cannot accept that it needs new blood. We need an entrepreneur that has been in business and not a Civil Servant. Mrs Dora Bakoyannis shw would be the best of all as well as come from a really good part of the EU. It is a puzzle why so many people want a person from the great central original EC area. To us in S E Europe the option must be the move for a local international politician of standing. The new wave of Countries before the inclusion of Ireland has to be the right way forward and in this the best recommendation I can think of is a Greek Politician of supreme record namely Dora Bakoyannis. No one realises apart from a few of us in the real politic that she has suffered for so long being side-lined in Greece as being the Leader that Never Was and thus in this she would be the most gracious of acceptees should she ever be approached. We must move away from the NW and W European hegemony of countries here as they have brought the whole of the EU to its knees. A new start is required and Dora has our vote in Bulgaria. About putting a free market businessman as a leader, lets see some examples of heads of companies that saved politics. Berlusconi? Be aware that having the business elit controlling politics is also known as fascism, it is when the state is controlled by corporations. I am not sure about about Dora Bakoyannis. She has exhibited opportunism in the past. as a greek i believe that greece needs to change its political personnel and not send them to europe at all. greece needs to get rid of these politicians that are sons and daughters of previous politicians or well connected people. Besides look at Bush in america, he was a disaster. We need Europe-wide opinion polls about who should be part of the Top 10 list of EU leaders. These polls should take place every 2 weeks from now on until the elections take place in 2014. This would create a Europe-wide democratic dynamics. Nobody seems to want this kind of polls, as they would threaten too much national political establishments. Even civil society organisations have not been able to get together and think through EU-wide political participation initiatives to go beyond compromises and negotiations between political parties and heads of state. Why so?